When I became a gardener in 2005, little did I know that I would also become an insect lover! 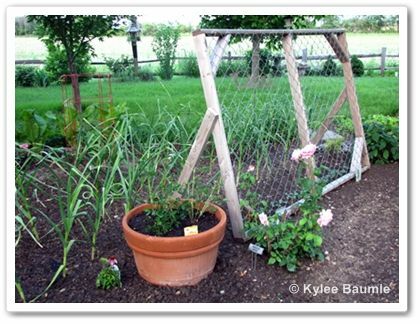 It's rather difficult to garden without making some sort of peace with the insects that inhabit your garden, whether they're good ones or bad ones. I've made it a point to research those that I encounter, so that I know which ones are which. 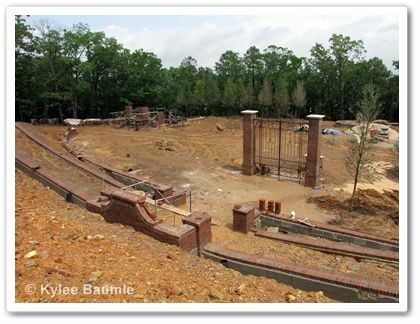 Our Little Acre in 2006. 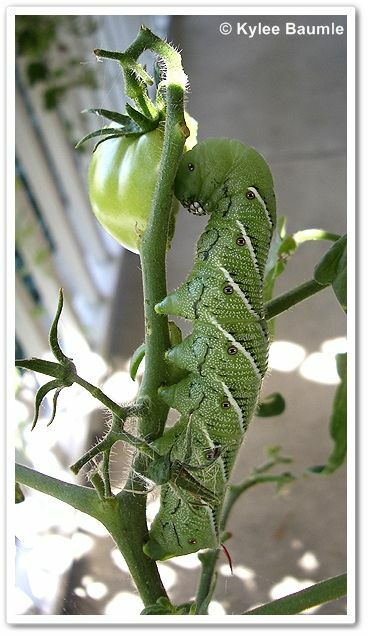 For example, I used to squash those tomato/tobacco hornworms until I found out that they're the caterpillar form of sphinx moths or hawk moths. These moths are pollinators of many plants, including oriental lilies, where I've seen them going after the nectar with their super long proboscises, most times after dusk. A favorite insect of mine is the citronella ant. 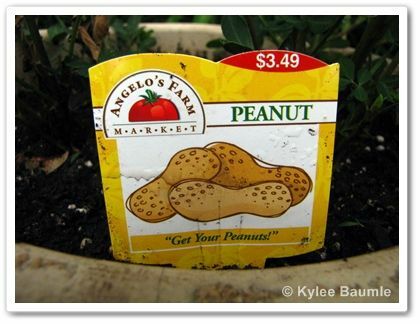 Romie and I first noticed this several years ago when we were planting shrubs. We'd dig down into the earth and the most wonderful, sweet smell would waft up and we both noticed it. It was very distinctive and the more we smelled it the more we wanted to smell it. We've both run into them many times since then and I actually love it when I do. The golden colored ants aren't very happy with us though. They emit the sweet lemony fragrance whenever they're threatened or crushed. Of course we don't hurt them on purpose because they aren't a harmful insect. 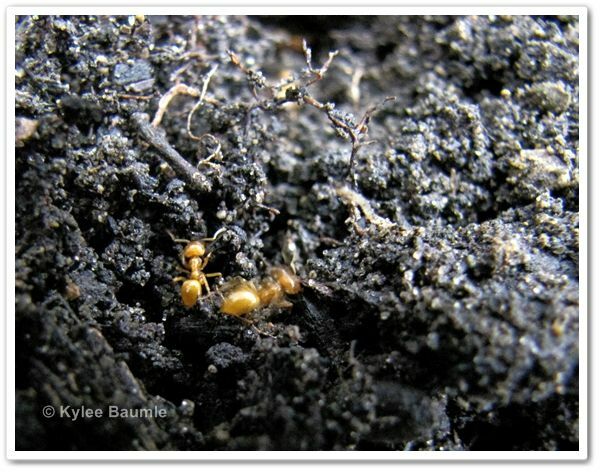 Citronella ants live underground, sometimes near the foundations of homes or in wood piles or decaying logs. They can get into homes if there's a crack in the foundation, but they don't reproduce there or live there. 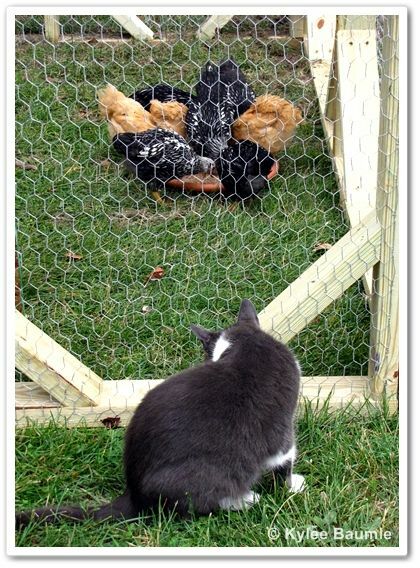 They're more of a nuisance than anything if they get in, but they don't go after food items. We've never had them in our house, though we've had the large black ones a couple of times. They feed on the honeydew that's left by aphids and mealybugs as these pests dine on other plants. 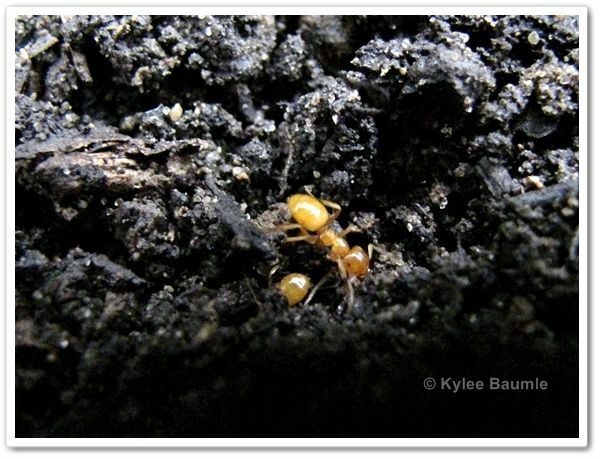 The citronella ants will gather aphids in groups so they can eat the honeydew left when they eat the roots of plants. Imagine that they're a farm family keeping cows in order to drink the milk they produce! 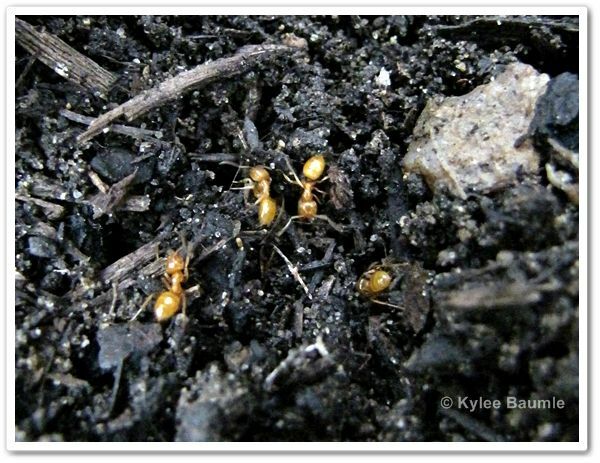 The next time you're digging in your garden, especially if it's next to the house, if you smell a fresh, lemony scent, look in the soil to see if you can see the citronella ants there. There are a couple of types, but the ones we have are small and yellow - just ¼ to ⅜ of an inch long. Some of them have wings. 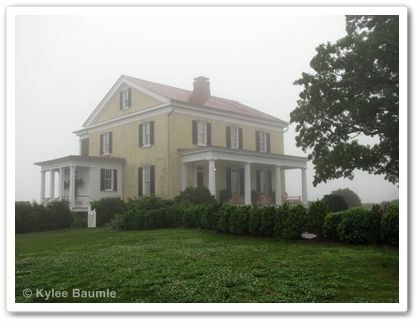 You might notice their mounds of excavated soil, too. That's a sign that citronella ants may be nearby. You can read more about the citronella ants here. For all the beauty that can be created in my garden by choosing this plant or that one, nothing makes me happier than to come across a field of wildflowers, growing where they may. 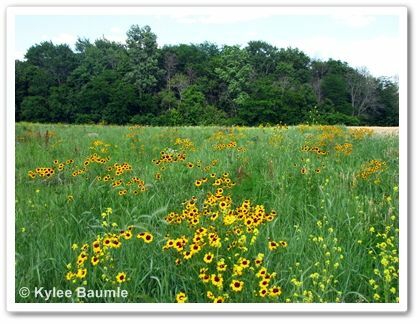 Just half a mile away from Our Little Acre, such a field exists and it's erupted into a beautiful medley of random color. Sunday afternoon was spent with our girls and their husbands around the pool, as it was a gorgeous summer day. They don't come any better. The pool was refreshing and the relaxed camaraderie was just what we needed after a busy work week, both at jobs and home, working on the gardens and the chicken coop. 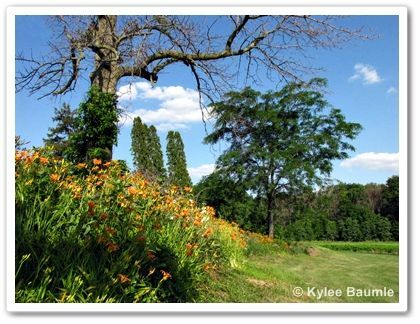 Before the day was over, a field trip was made, and the wildflowers were admired and photographed. It never fails to amaze me that such a simple thing fills me with such appreciation for God's creation. 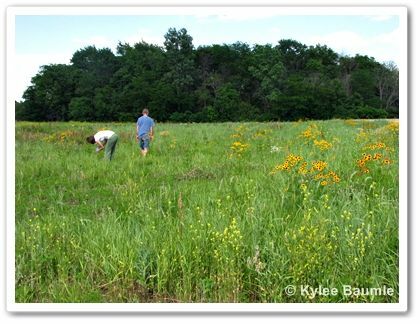 It was last year that we first noticed the Coreopsis and Rudbeckia growing in the set aside field. This particular field floods on a regular basis, which may be why it's rarely planted by the farmer. It is left to grow as it pleases, but gets mowed from time to time. That's why we made a special trip down to see it and photograph it, before it's cut down. 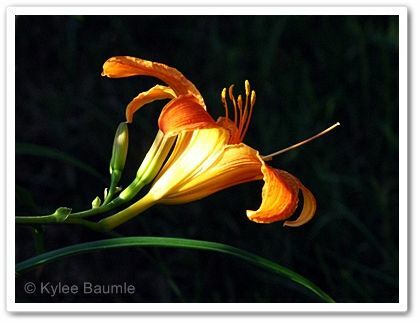 Daughter Kara enjoys photographing flowers as much as I do. 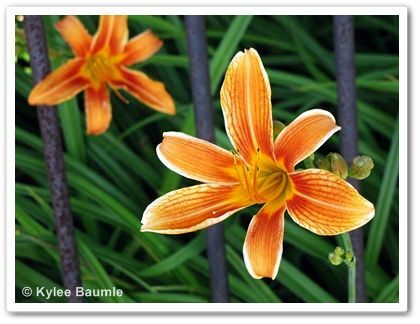 A fun thing about walking through the field is finding various types of the same flower. 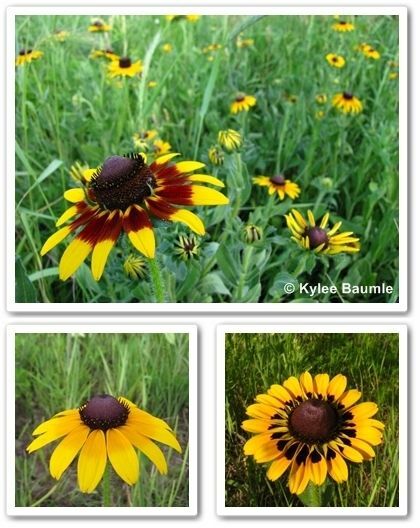 For example, the Rudbeckia comes with quilled petals, straight petals, some with a slightly darker eye ring, and some with a dark brown dotted one. There's quite a bit of milkweed (Asclepias sp.) 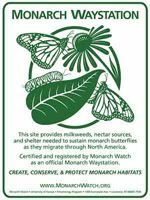 growing in the field, too, which makes me happy, since it's vital to the survival of the monarch butterfly. It's the only genus of plants that their caterpillars eat. 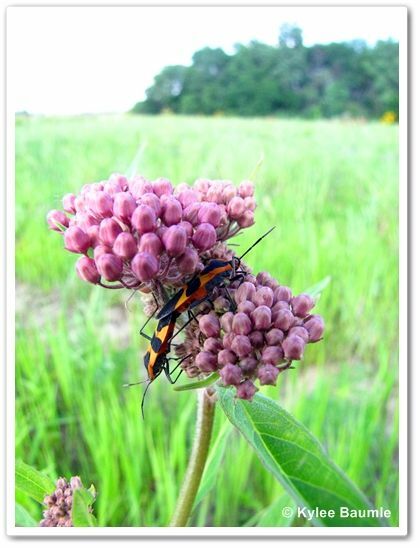 Milkweed bugs (Oncopeltus fasciatus) like it, too. remain connected for as long as 10 hours. 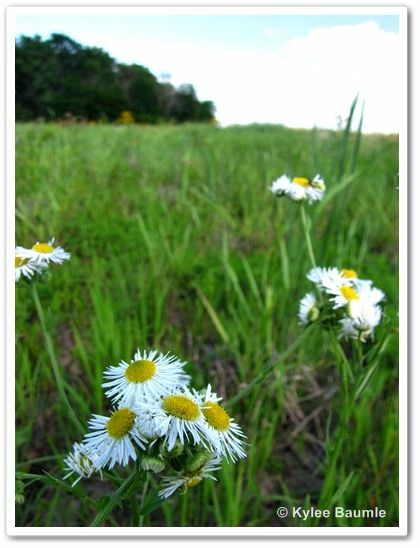 Fleabane (Erigeron sp.) also grows in abundance. 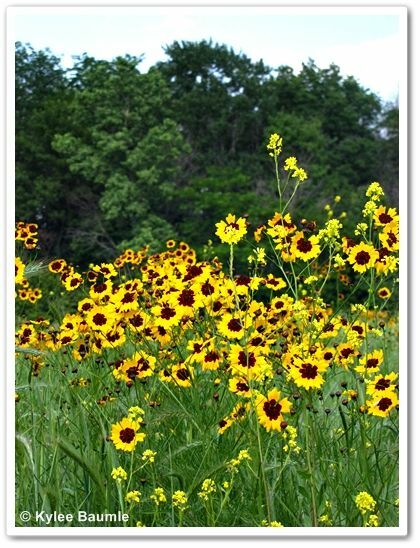 By far the most eye-catching, probably because of their height (3-4 feet) and numbers are the plains coreopsis (Coreopsis tinctoria). This is an annual that readily self-seeds. It does seem that there are many more this year than last. 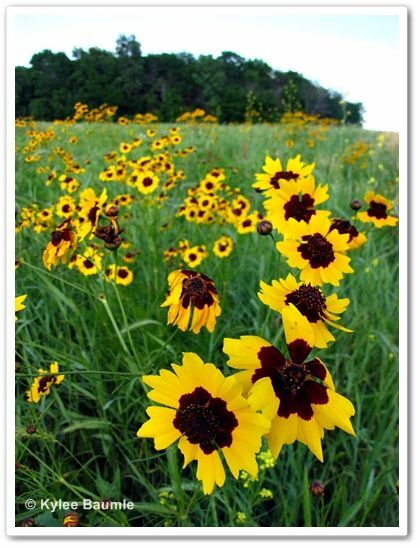 Plains coreopsis (Coreopsis tinctoria) has a dark burgundy eye. On the way down to the field, the shallow ditch along the road has its own assortment of delights. 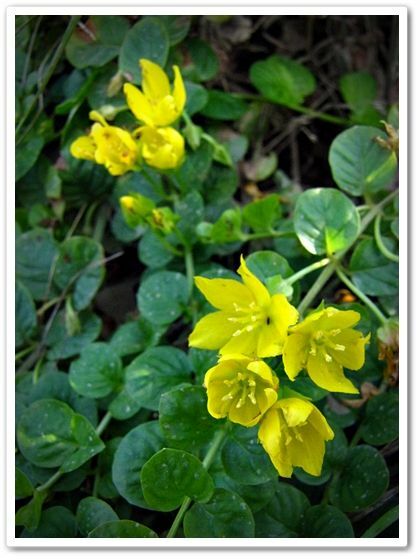 Creeping Jenny (Lysimachia nummularia) lines the wet depression for its full length. 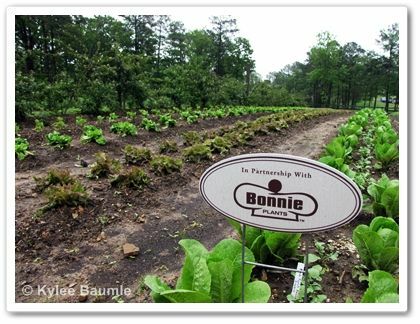 I remember many years ago, Romie dug some to plant at Our Little Acre and it wasn't very long before I was digging it out. I wasn't a "real" gardener back then and was naive to its penchant for world dominance. But I do like seeing it in the ditch. 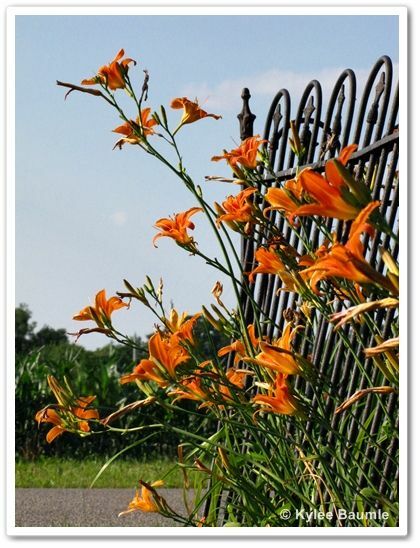 Adjacent to the field is a cemetery, which has the common ditch lilies (Hemerocallis fulva) in full bloom. 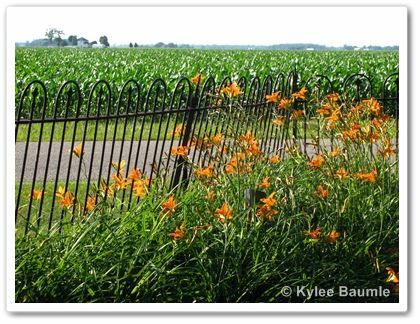 This daylily has been the target of much ridicule and dismissed by many as a common weed, but I can't imagine our roadsides and cemeteries being without it. I love this variation with a white edge. Another commonly found wildflower here is the swamp rose (Rosa palustris). 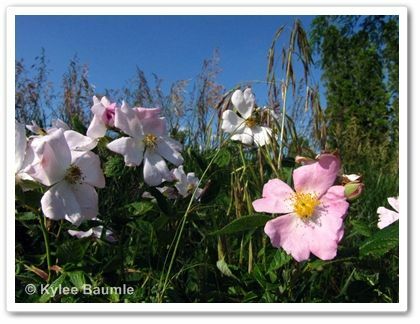 I simply call it a wild rose and love seeing it in the ditches too, a testament to its preference for wet places. It's not surprising that there's a lot of it here in what used to be The Great Black Swamp. Nothing makes me happier than to see our native wildflowers in bloom. Fortunately, we live where we can find any number of them doing just that close by at any given time of the spring, summer, and fall. 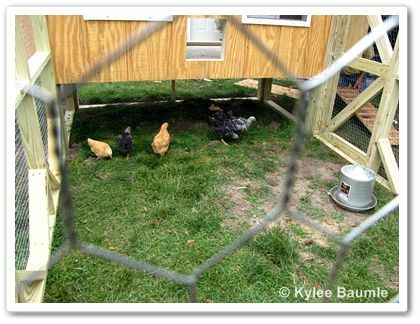 No, the chicken coop isn't entirely finished, but it and the attached run are done enough that the chickens are finally living in it! Romie has been working a four-day work week ever since the earthquake in Japan, due to his business being affected by the damage to some automotive supply companies in that part of the country. So he was home all day yesterday and so was I. 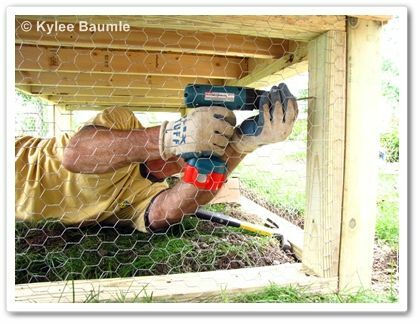 The day was spent working like crazy to get the chicken coop done enough that the chicks (which really aren't "chicks" anymore) could start staying in it. I had started painting the inside last Sunday and I finished that, while helping him with the run when he needed it. 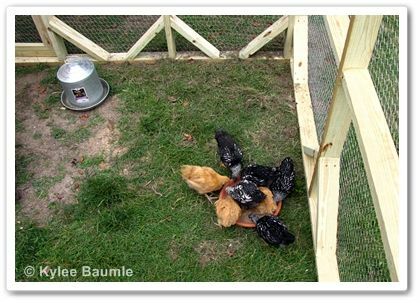 Around 5:30 p.m., I got down on my hands and knees in the conservatory and grabbed eight squawking chickens who were huddling in a corner under the benches, and handed them to Romie, to put in the run. They loved it. 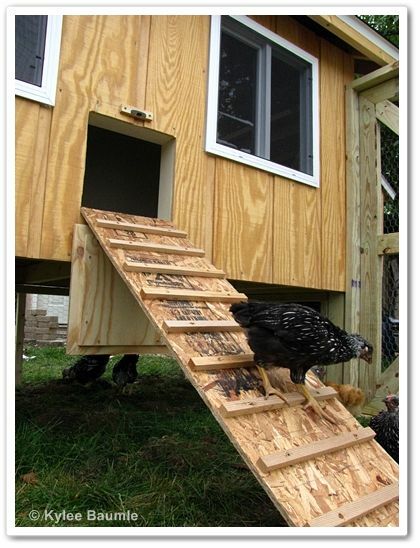 They immediately began pecking and scratching and exploring every corner of it. All of the commotion got the attention of the cats and they positioned themselves at various spots around the run to watch the big birds. I have no doubt that a couple of them would have tried out their hunting skills on them if they could have gotten to them, but they had to be content to just watch. 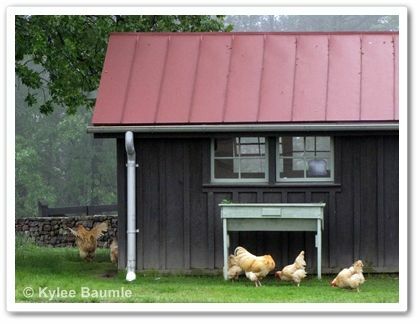 There is much to be done to the coop yet. 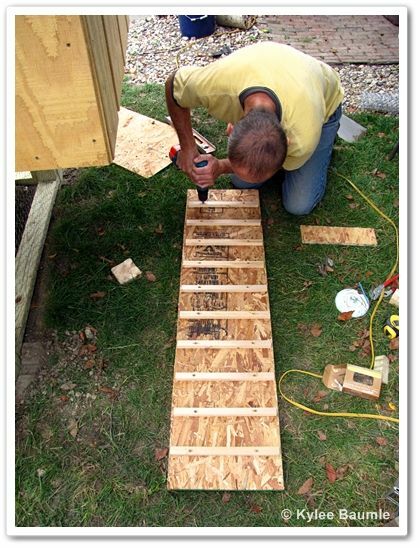 The top cover of the run has to be constructed and added, to keep predators out. Trim has to be put on the outside in places and of course, more painting. The conservatory has to be painted yet, too, so we'll do them at the same time. 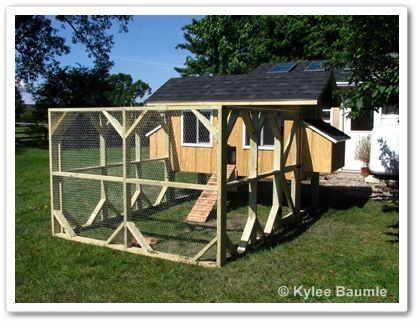 And there's the matter of a walkway and some landscaping around the coop to do. Speaking of the conservatory, you can imagine what a mess the chickens had made of the inside of that. We have a stone paver floor, and it was covered in doo-doo, but the entire room was also covered in chicken dust. The plants that were in there looked like they'd been in Miss Havisham's house. We spent the rest of the evening cleaning out the conservatory and though I was tired before we began, I'll admit I'm glad we went ahead and did it last night. 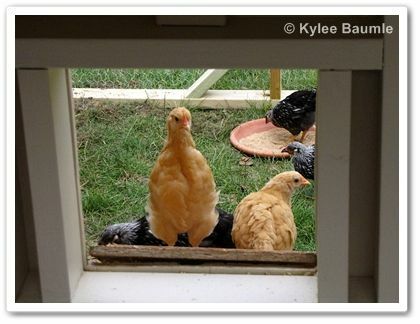 This morning, the chicks are back outside in their run and back to their pecking and scratching. They have such a rough life. This spring, I've been sent several garden tools and other garden products to test for review. I enjoy this, because once in awhile, I receive a product that I not only like, I really like it and I want to tell others about it. Such is the case with the garden torchier that I received recently from Koopmans Gardenworks. Based in Batavia, Ohio, Koopmans' torchier is a simple design, but the quality with which it's made is outstanding. When I first unboxed it and put it up in my garden, I wondered to myself whether or not the heavy clay bowl was going to stay on the stand it came with. But I needn't have worried. 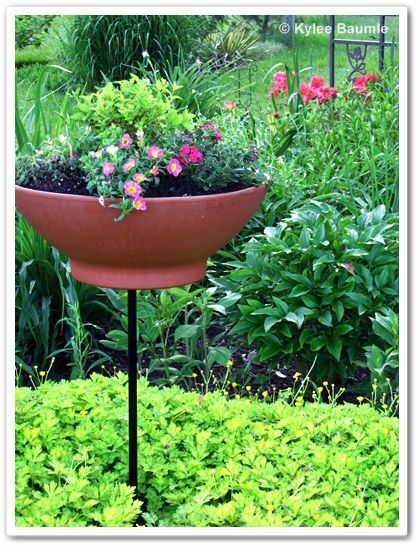 This is a heavy-duty steel post (with a beautiful powder coat finish), with a Quadri-Stab base that stabilizes the whole thing when you put it in the ground. The clay bowl (sold separately) is a very nice heavy Italian terra cotta. Mine came with a hole drilled in the bottom for drainage, as well as a larger one in the center, where the base inserts. But you can use any bowl as long as it has a center hole large enough for the 5/8-inch base centering pin. 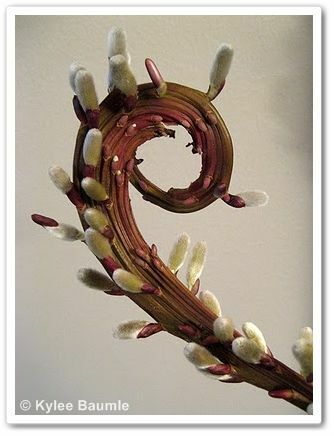 Sadly, we lost our 'Sekka' Japanese Fantail Willow tree over the winter. I wasn't surprised that it didn't leaf out this spring, because it began to lose its leaves too early, late last summer. I guess three years in a row of droughtish summers was too much for it. But we had five good years together. Under the willow, a nice thick mat of variegated creeping buttercup (Ranunculus repens 'Buttered Popcorn') developed over the years and the kitties loved to nap in it under the tree. Without the willow there, the buttercup looked rather out of place, like something was missing. weeks, I think it will look even better! This is the 24" base with an 18" bowl. So the garden torchier found a home and I really like how it looks in the middle of the buttercup. 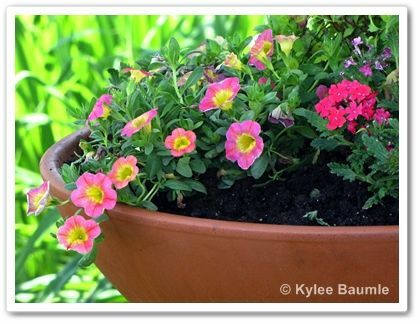 I planted it with trial plants I received from Proven Winners the week before - Spiraea Double Play® Gold went in the center, surrounded by Superbells® Sweet Tart Calibrachoa and Superbena® Royale Iced Cherry Verbena. 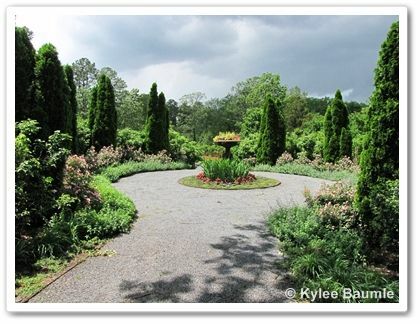 Since the Spiraea is a perennial shrub, I'll plant it in the ground this fall. For now, it's small enough to use in this container. The garden torchier was just the thing I needed to replace the willow. (The location was a bit crowded for the tree anyway.) I can plant it up differently each year to give the area a change in looks. Koopman's is a family-owned business and they've been selling the torchier since 1977. The base is made in the U.S. and has a 10-year warranty. The company will even refund your purchase price plus the initial shipping cost if you don't like it after 30 days. But I'm betting they haven't had to make good on that very often, if at all. This really is a quality product, all the way around. 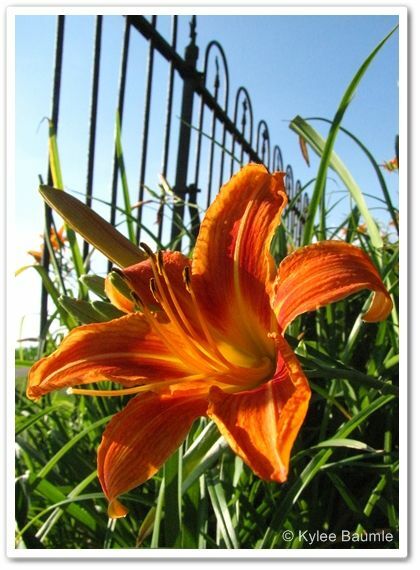 For more information, you can visit their website at KoopmansGardenWorks.com. It is also offered for sale at Horticulture magazine's Gardener's Hub. 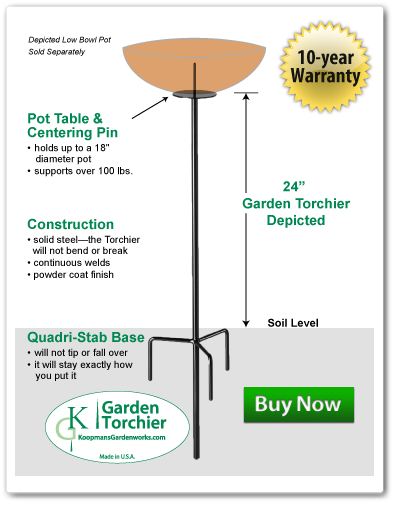 I received the Koopmans Garden Torchier free of charge for the purpose of trying it and reviewing it. 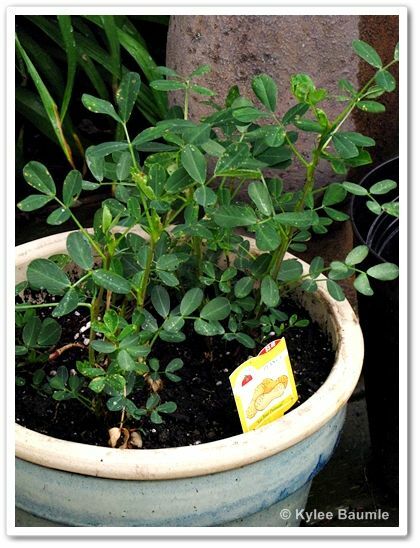 I also received the plants from Proven Winners as part of their trialing program at no charge to me. As always, the opinions expressed here are my own, unless otherwise quoted. This time of year brings something a little unpleasant in that no matter how careful I am, I manage to get poison ivy somewhere. I'll admit that I wasn't as careful as I could have been this spring though. 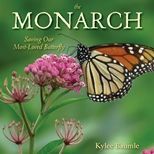 I distinctly remember pulling weeds, getting into a nice rhythm, and just as I reached for that three-leaved one, it was like I was watching myself in slow motion. Even as I grabbed it - bare-handed (shame on me!) - I knew what it was, but couldn't stop myself. I immediately went to the nearby swimming pool and washed my hands, rubbing them back and forth vigorously, and then went in the house to wash some more, this time with soap. I'm convinced this helped me avoid a nasty reaction, but I still had outbreaks on several fingers of both hands. I've got a small area on the inside of my left elbow and my left knee, too. 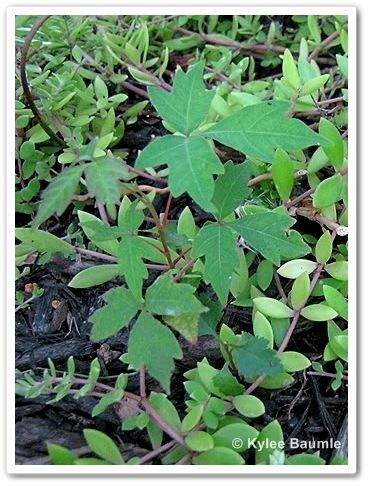 In recent years, it seems that we've got more and more poison ivy seedlings that pop up throughout the summer. We both know well what it looks like, which helps when it comes to ridding our property of it. It has three notched leaves, a red stem when it's young, and nearly always is growing at the base of trees. I can count on finding it under the shagbark hickory. Likely, the birds have eaten the berries from a different location, perhaps in a nearby woods or along the ditch banks, and then they excrete them as they rest and nest in our trees. The result is a new crop of poison ivy. 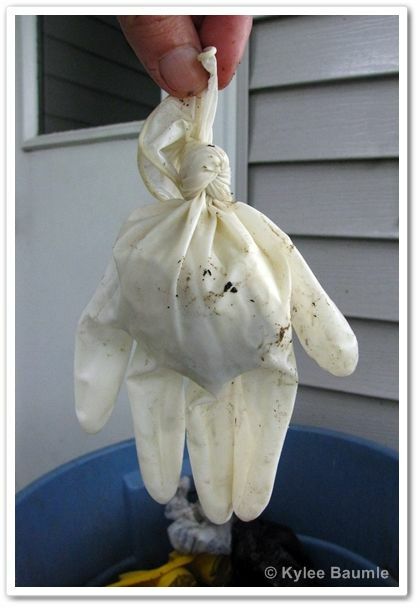 My method of removing the seedlings is this: I have a box of latex gloves just for unpleasant tasks. Pulling poison ivy certainly qualifies as one of those! I wear the gloves as I carefully pull the seedlings with my left hand, putting them then in my right as I walk around, trying to remember where I've seen the poison ivy during my gardening tasks. Once I've gotten them all, I wad them up into a ball in my right hand, carefully pull that glove off inside out, with the seedlings inside, put that in my left hand, then also carefully pull off that glove inside out with the entire contents inside. I tie a knot in the top and toss it in the garbage. Today, I found 13 seedlings. I wish I'd left that 14th one for today's poison ivy patrol. The offending substance in poison ivy is urushiol and it's so potent that only ¼ ounce of it would be enough to infect every single person on earth. Poison ivy only grows in the eastern United States, so you can get away from it by moving to California, where they have poison oak. 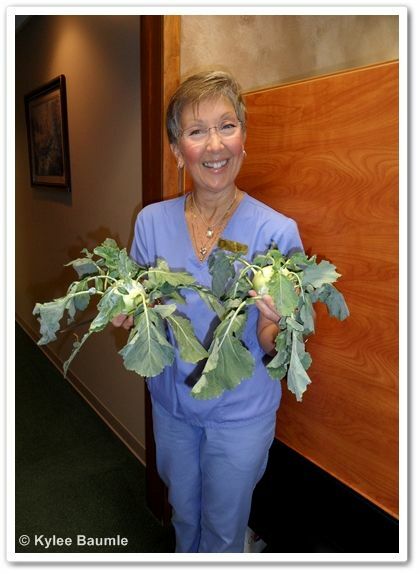 One to five years is the normal length of time for urushiol to stay active on any surface. You cannot get poison ivy from another person unless they still have the urushiol on their skin. It also doesn't spread by opening the blisters. It's only spread by the oil from the plant itself. 90% of the population is allergic to urushiol. I've never been to Sweden. I've been to Iceland, but that's besides the point. 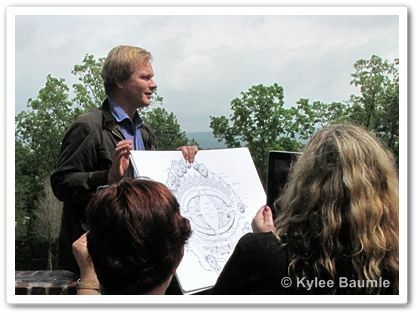 I used to be so enamored with all things Swedish. 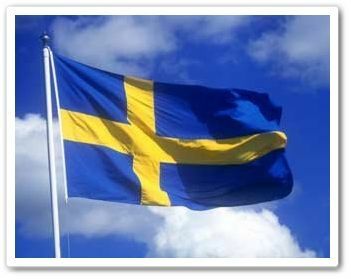 When I had to do a report about a country for school one time, I chose Sweden. I don't know what the appeal was, but now, as an adult, there are a couple of Swedish things that have found my favor. The first (and only) time that I visited an IKEA store, I ate lunch there. I had Swedish meatballs with a sauce on it made from lingonberries, and it was good. Lingonberries taste a little like cranberries, with a tart, yet sweet, taste. Whenever I can find it, I buy lingonberry jam. Someday, I hope to make some of my own, because I'm growing lingonberry plants here at Our Little Acre. I purchased the plants from Miller Nurseries last spring, and planted them in a mostly shady area of our garden, where they only get a little morning sun. Shady, because they naturally grow in the pine forests of Sweden (among several other places in the world). 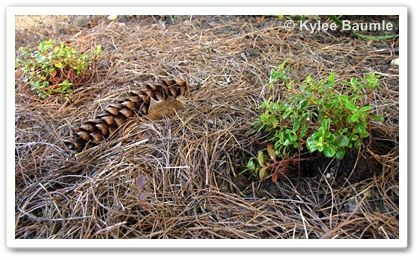 We've got alkaline soil here, which isn't their favorite, but I'm mulching them with pine needles in the hopes that they do like that. They've not grown much yet, but they still look like healthy plants! Earlier this spring, I got a chance to try out another Swedish thing - Cape Clogs. I'd come across them online and the owner generously offered two pairs of them to try, free of charge. I chose a pair with flowers on them, (of course), and then looked through their other styles to see what I might want. 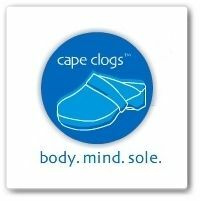 Cape Clogs have been around for five years, in fact, they're celebrating that fact right now on their website. Most styles are made of leather and yes, they have wooden soles, and they are made in Sweden. I'll admit, when I first thought about wearing these shoes - before I ever saw them for real or tried them on - I didn't think they could be that comfortable. How can a shoe with a wooden sole that doesn't bend be comfortable? Well. The shoes arrived and I put them on. Oh my goodness. I'm not sure how they've done it, but these shoes are very comfy! They have an arch support and they fit my feet so well that I started choosing my outfit for the day to match, just so I could wear my new shoes. I'm not kidding. For the second pair of shoes, I chose the cranberry red patent leather style with a strap. 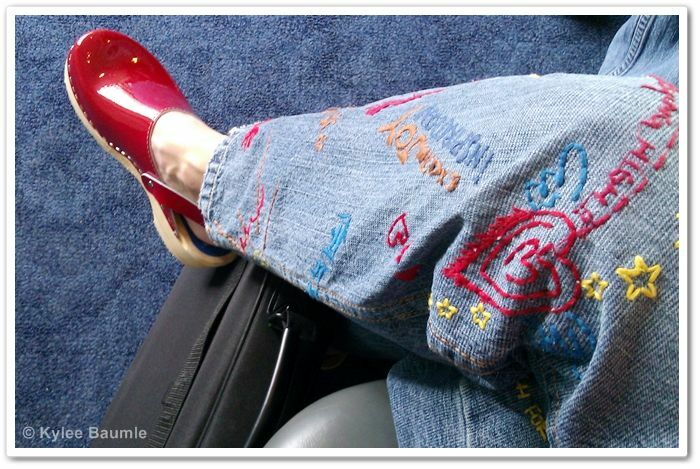 When I first saw Cape Clogs, the floral ones were the ones that caught my eye, but I have to tell you, these shiny red ones are my favorites. And every single time I wear them, I get comments like, "Oh my gosh, I LOVE your shoes!" and "Where did you get those shoes? I love them!" 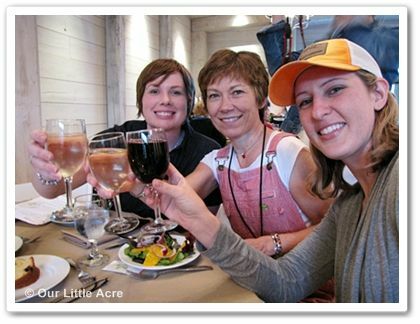 I wore them when I went to Arkansas for Garden2Blog at P. Allen Smith's and Mary Ellen, his social media person, loved them and tweeted about them. I've started wearing the floral ones to work. 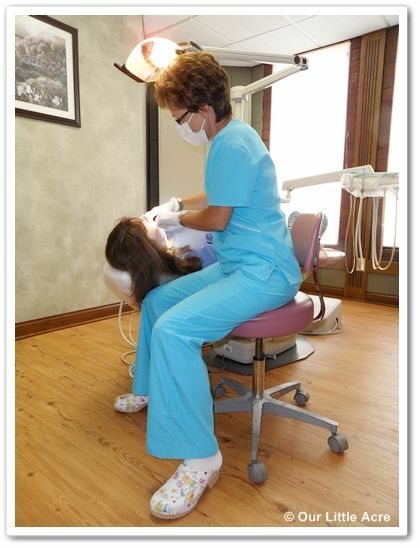 I'm a dental hygienist when I'm not in the garden or traveling to garden events, and I have an assortment of colors of uniforms. These shoes go with all of them! This no-strap style seems to run a bit bigger than the ones with a strap, but with socks, they fit fine. Thank you, Pamela at Cape Clogs, for allowing me to try these shoes. I love them and sing their praises whenever I wear them. I love the black and white polka dot ones I've seen on the site and I might just get a pair of the boots for winter, too! 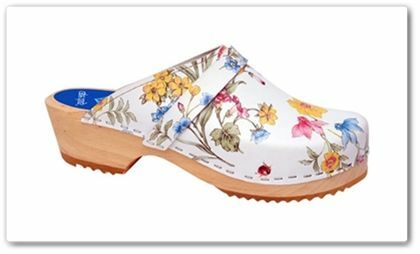 You can buy Cape Clogs directly from their website, or in a number of other online stores, including one of my favorites for gardening shoes, Garden Shoes Online. They are now appearing in several bricks and mortar retail stores, too. As I said in my review, both pairs of Cape Clog shoes were sent to me free of charge. I was under no obligation to write favorably about these shoes. I really do like them. A lot. 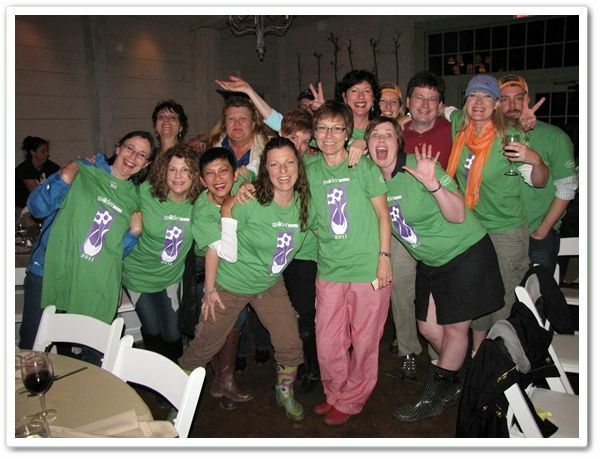 Playing in the gardens with other fanatical gardeners and garden writers is such a fun thing to do and we got the chance to do plenty of that at Garden2Blog. 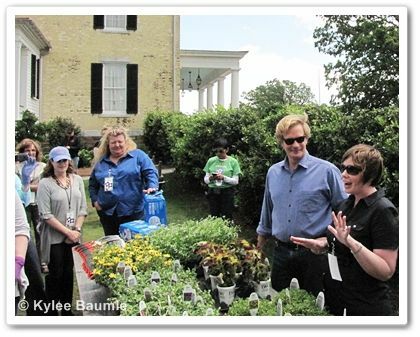 The fact that we were doing it in P. Allen Smith's gardens (with P. Allen Smith!) made it even more special. 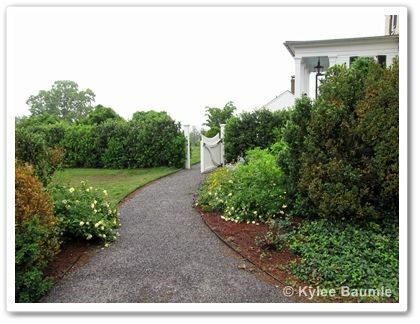 After spending a day with him, touring other gardens and sharing good food, we got to know Allen and his staff a bit better, and that made our day at the Garden Home Retreat feel like we were visiting good friends. 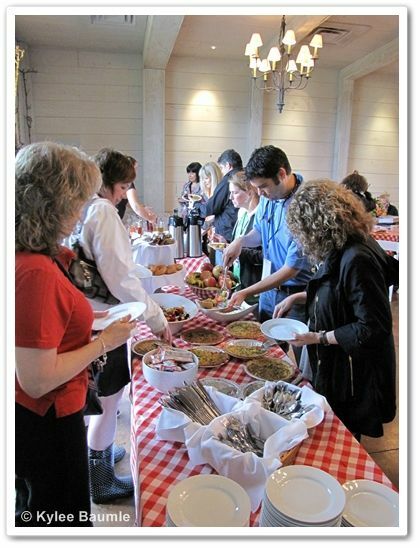 The entire experience had a family reunion feel to it. 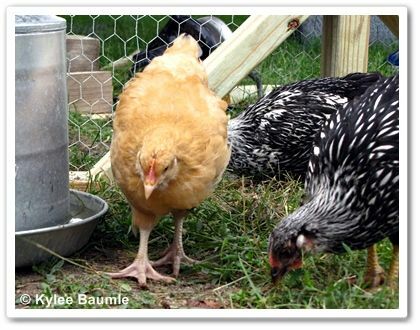 Allen has, among others, Buff Orpington and Silver-laced Wyandotte hens, which is what we have here at Our Little Acre. There's a reason for that! 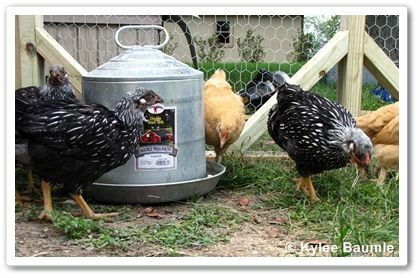 Allen and I had a conversation about chickens while I was there, in which I sought his advice about which breeds to get, thus the Buffs and Silvers. Activities for the day began shortly after breakfast, and a full day it was! 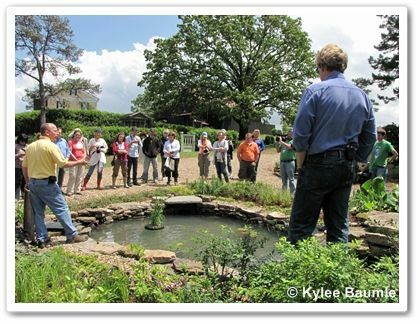 There were workshops in and out of the gardens involving container planting, vegetable gathering, garden tools, water features, learning about new plant introductions and those currently offered, as well as other activities. We dodged raindrops off and on during the day, but managed to get everything in that was on the agenda. 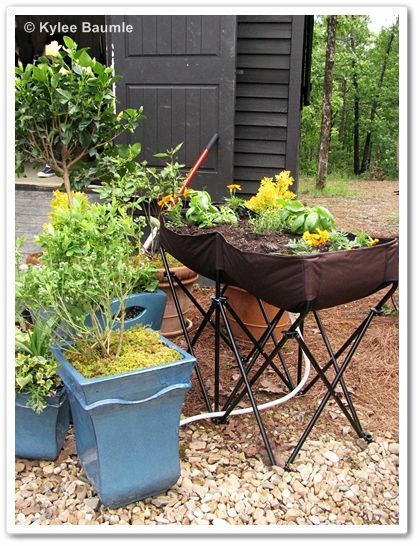 Easy Gardener offers a convenient planting container that is easy to assemble and easy to plant and harvest. All Garden2Blog attendees received one of these after we got back home. More on this later! 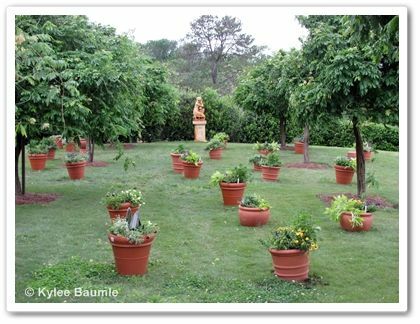 Danielle Ernest, of Proven Winners, showed us some of their new plants offered this year, and challenged us to plant a container using them. It was great fun as we all scrambled to put together our containers. At the end of the day, various prizes were awarded for several categories such as "Most Creative," "Best Use of Foliage," and "Best Use of Color." 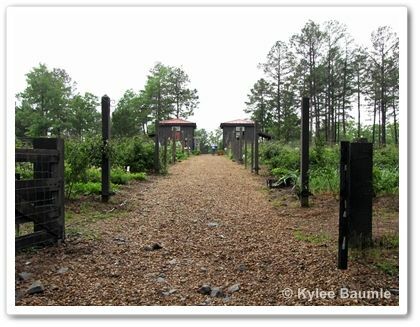 In the one-acre veggie gardens, we learned about Bonnie Plants and their unique biodegradable pots, The Berry Family of Nurseries and blueberries, GardenSafe's organic products, and Jobe's Organics. GardenSafe held a scavenger hunt for various vegetables and the first three people to bring back all the vegetables on the list won a prize. I was speedy and received a $100 gift certificate to Allen's gift shop! I used my certificate to get an egg gathering basket, one of Allen's books, a t-shirt, and a couple of books for my mom. Thank you, GardenSafe! 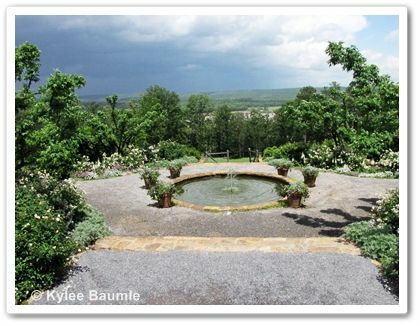 Laguna Ponds had constructed a small garden pond near the house. They also had a contest featuring their easy-to-assemble water fountains, with the winning group each receiving a water fountain of their choice! 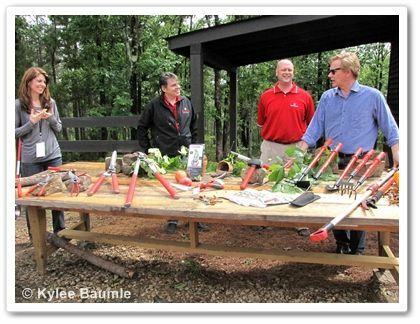 One of my favorite garden product companies, Corona Tools, was also there, and told the story of their company. 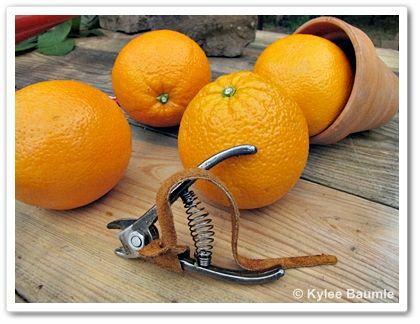 Corona Tools originated in the orange groves of California, with a small tool used to remove the stem on oranges so they would transport better, without bruising from the stem. We each received one of the little tools, as well as a trowel to take home. 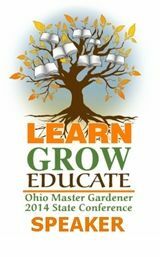 Learning about gardening products was interesting and fun, and the best part was doing it all on part of the 650 acres of Moss Mountain Farm. 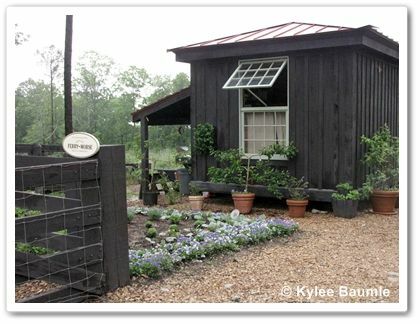 The property is absolutely beautiful and is appropriately named the Garden Home Retreat. A feeling of peace and tranquility reigns in this place. 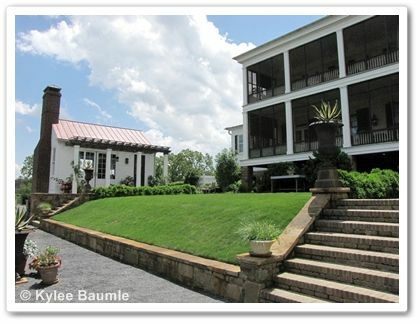 The croquet lawn and summer kitchen at the back of the house. 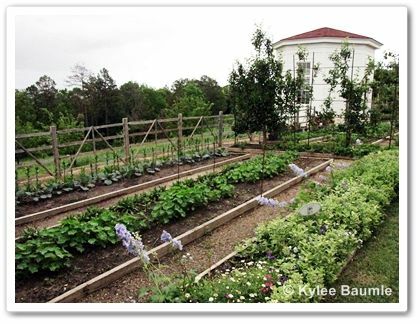 Some of the raised bed gardens behind the house. You can catch a glimpse of the Arkansas River in the background. 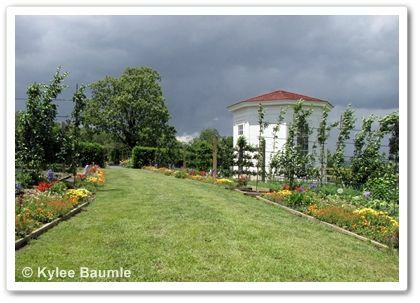 Allen had hoped that the large rose garden he's having constructed would be pretty much finished by the time we arrived, but their wet spring prevented it. 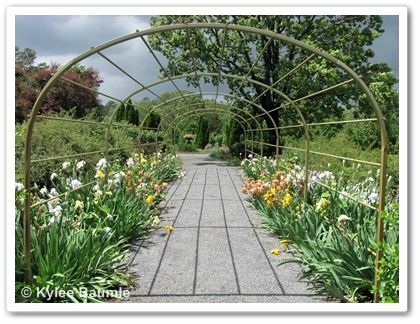 Now completed, the rose garden encompasses 18,000 square feet, terraced with roses that span the centuries, from heritage roses to modern-day Knock-Outs. 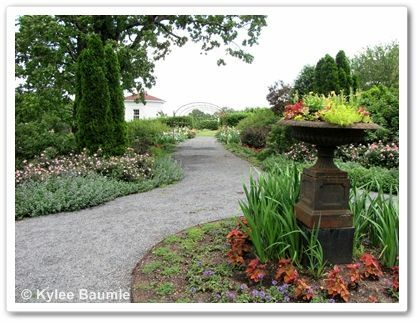 You can find other garden tips on Allen's YouTube channel here. 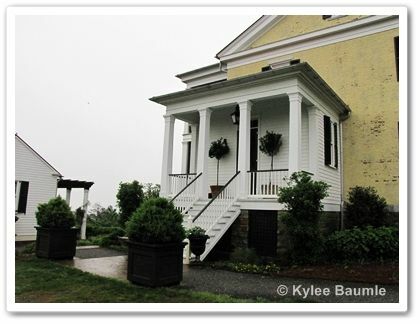 There was much to take away from the Garden2Blog experience. 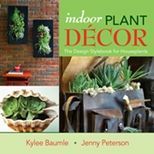 I learned about some garden products that I wasn't aware of before. I liked having such easy access to their representatives so I could ask questions of them if I wanted to. 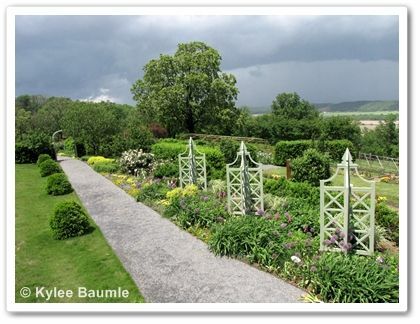 I was able to spend time with other gardeners, garden writers and garden-related people not only discussing our mutual interests, but simply enjoying them on a personal basis in a lovely place. 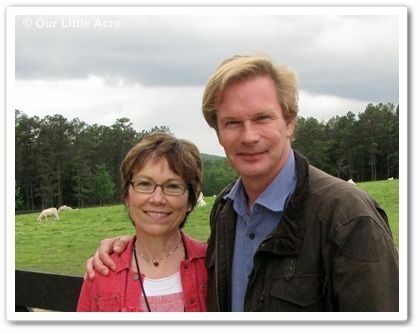 I got to know P Allen Smith a bit better as a person and what he's all about when it comes to his business. 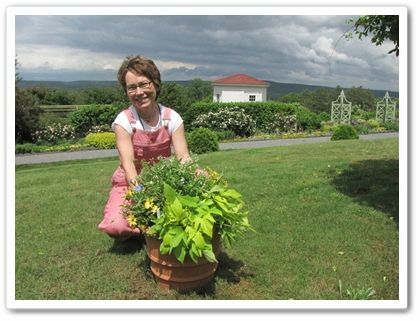 I think they're one and the same: He truly loves gardening and what it does for the body and soul of the gardener. 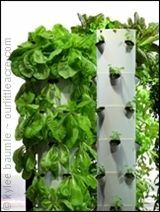 He feels that everyone can garden and his mission is to help people do that, no matter if they've got acres or simply a patio or balcony on which to do the growing. 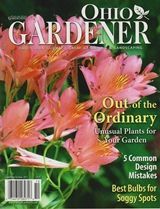 Allen doesn't see himself as a celebrity, although he certainly is that, but more a garden authority and teacher. 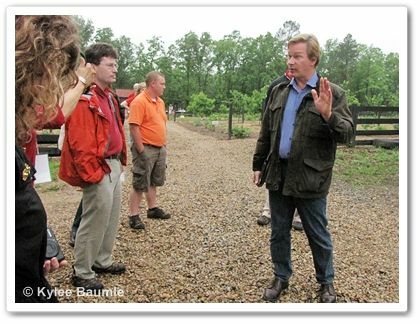 He has a quick wit, coupled with southern charm, and it was a delight to be in his company, all the while gaining knowledge and ideas that I can use in my own garden and share with others. 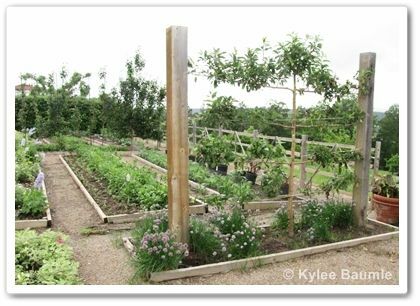 What a privilege it was for me to be included in this Garden2Blog experience. Thank you, Allen, and also thank you to the staff, the sponsors, and the many people it took to make the event happen. It surely will be one of the highlights of my gardening life.